A team of researchers with members from the U.S., Germany and Sweden has discovered that the cellulose found in bacterial biofilms differs from the cellulose in plants. In their paper published in the journal Science, the group describes how they found the difference and what their findings might mean for developing new ways to combat bacterial infections. Michael Galperin with NIH in the U.S. and Daria Shalaeva with Moscow State University offer a Perspective piece on the work done by the team in the same journal issue. One of the reasons that bacterial infections can be difficult to treat is their tendency to form biofilms resistant to penetration, making it difficult for antibiotic agents to reach and kill them. Such biofilms, Galperin and Shalaeva note, can cause a bacterial infection to shift from an acute infection to a chronic infection. Over the years, scientists have studied bacterial biofilms hoping to find a weakness that might be exploited to make them less protective of the bacteria hiding within them. Unfortunately, up until now, little progress has been made in this area. In this new effort, however, it appears the researchers have found something in the makeup of the biofilms that might make it possible to weaken them. 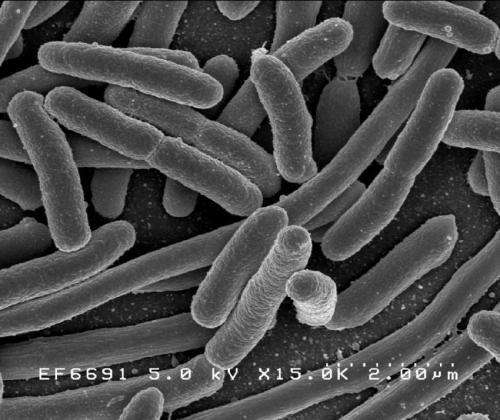 To learn more about the makeup of biofilms created by Escherichia coli, the team took a closer look at some samples using nuclear magnetic resonance spectroscopy. They discovered that the cellulose that forms the backbone of the biofilms differed from the cellulose found in plants—it had a phosphoethanolamine sidechain that does not occur in plants. That sidechain allowed for the creation of a form of cellulose that was denser than is seen in plants, making it more resistant to shear forces. The researchers also found the gene responsible for it—bcsG. And when they turned that gene off in test bacteria, they found the films produced were less robust. This suggests, of course, that developing a method to turn off the gene in bacteria involved in an infection could weaken the biofilm, allowing antibiotic agents to penetrate and kill them. Cellulose is a major contributor to the chemical and mechanical properties of plants and assumes structural roles in bacterial communities termed biofilms. We find that Escherichia coli produces chemically modified cellulose that is required for extracellular matrix assembly and biofilm architecture. Solid-state nuclear magnetic resonance spectroscopy of the intact and insoluble material elucidates the zwitterionic phosphoethanolamine modification that had evaded detection by conventional methods. Installation of the phosphoethanolamine group requires BcsG, a proposed phosphoethanolamine transferase, with biofilm-promoting cyclic diguanylate monophosphate input through a BcsE-BcsF-BcsG transmembrane signaling pathway. The bcsEFG operon is present in many bacteria, including Salmonella species, that also produce the modified cellulose. The discovery of phosphoethanolamine cellulose and the genetic and molecular basis for its production offers opportunities to modulate its production in bacteria and inspires efforts to biosynthetically engineer alternatively modified cellulosic materials.